What top South African military analyst Helmoed Heitman has called “political correctness gone insane” is proceeding according to plan. Heitman’s comment came in the wake of an Armscor announcement last September that modifications, some of them large scale, would be done to three SA Air Force (SAAF) aircraft types. The state-owned defence and security acquisition agency said in September the modifications were “modernisation to accommodate pilots in the 21st century” and boost aircraft safety. 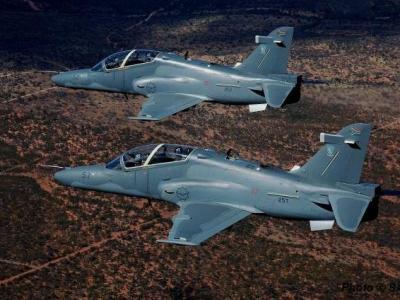 According to Armscor the modifications will provide for “a mass aircrew expansion” on the PC-7 trainer, Hawk Mk 120 Lead-In- Fighter Trainer and JAS39 Gripen fighter. Armscor Group Executive: Corporate Support, Solomzi Mbada, said in response to a defenceWeb enquiry that cockpit modifications on the PC-7 were “nearing completion” without giving detail of what has been done and to how many aircraft. “Cockpit modifications for the Hawk and Gripen are envisaged to be completed towards the end of 2019,” he added. On hearing of the planned changes, said by Armscor to follow concerns raised “regarding the unfair exclusion of small built females” to pilot these aircraft types, Heitman made his “PC gone insane” comment. Elaborating, he said “some people are simply too small, too light, too tall, too large or too heavy to be fighter pilots. “Tough, fly something else! I remember a former chief of the Zambian Air Force telling me the ‘great tragedy’ of his life. He wanted to fly fighters, but was simply too tall and too wide across the shoulders. No nonsense of redesigning and requalifying ejection seats, he simply accepted he had to settle for flying transport aircraft,” Heitman said with the added comment that “it (the modification) is not going to be cheap if it is to be done properly”. There is no recent indication on the Armscor tender bulletin of equipment that can be utilised to change or upgrade ejection seats in either the PC-7, Hawk Mk 120 or Gripen and Solomzi did not provide any costing information in his response.